San Francisco's Downtown Rail Extension (DTX) route has been decided. 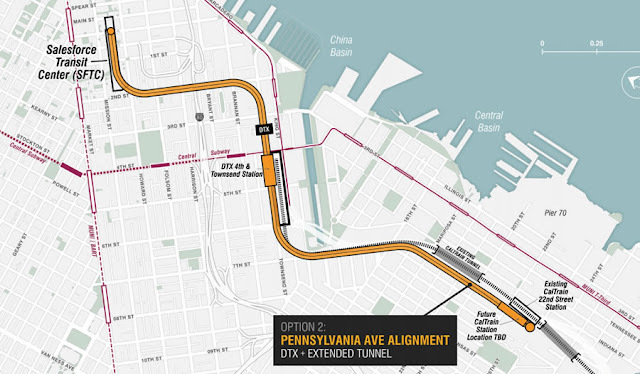 The San Francisco Planning Department selected the "Pennsylvania" option as the preferred alignment to bring Caltrain and high-speed rail to the Transbay Transit Center. A vision of Caltrain stops in San Francisco once DTX opens. Blue shows walk distance up to 1/3 mile and orange is a 10 minute bus or Muni Metro ride. Let's open the question of where the new stations on the line should go. Assuming they should be placed where they are today assumes that the location decisions may 50-100 years ago is the best for today. New Caltrain vehicles will be coming. There are many questions about financing the project, who will build it, what's needed to be cleared environmentally, how long will it take, and when will it actually open. I won't be addressing those questions. I don't have the answers but will say, fund it, and HURRY UP! I'm here to discuss the stations and where to put them. A lot of thought goes into these mega projects, but sometimes, due to complexity, some items are given less attention than they deserve. What am I getting at? I'm saying, we have a new tunnel, which will have new and more frequent service, yet we haven't discussed station locations and often assume that the existing ones are fine without asking ourselves, where would the best station locations actually be? 1. DTX - Peninsula rail access into Downtown San Francisco: Getting Caltrain passengers and High Speed Rail passengers into Downtown San Francisco is critical. More people will use Caltrain once it gets to the Salad Spinner Transit Center (err, Transbay Transit Center), and fewer people will "have to" drive. 2. Connections to other transit: Making easy, short, and legible transfers between stations so people can get to where they need to go easily. That means making Caltrain and BART have great transfers. The BART to Caltrain transfer between Embarcadero and Transbay Center will be long and isn't even certain of being built. So let's make sure a 2nd Transbay rail line makes a great transfer with Caltrain, whether it's in Downtown, at 4th & King or in Mission Bay. 3. Stations located where ridership demand is and will be the highest. Why have a station where few people will use it. Let's make stations be where the most people can benefit from them, whether they live nearby, work nearby, shop nearby, go to school nearby or take their kids to school or daycare nearby. What's set in stone, and what do we have? 1. 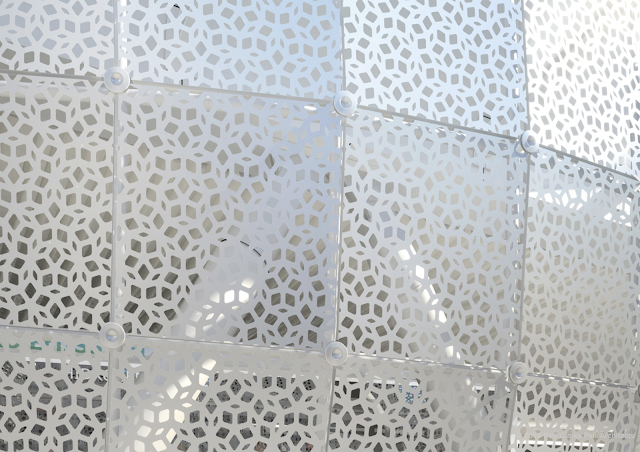 Stations: Transbay Transit Center (aka Salesforce Transit Center) or "Salad Spinner" for short. This location isn't moving. No other station current, past, or planned is absolutely required. 2. Alignment: now that the Penn alignment is picked, and the existing rail from Potrero Hill to Brisbane is set, we can know where tracks are and will go. SF Planning's preferred Pennsylvania Ave alignment that was chosen over the Mission Bay (Third St) alignment. What's fluid, pending or undecided? 3. Location of other stations between Downtown San Francisco and South San Francisco. I'll be focusing on San Francisco's station options. 4. Alignment and station locations of a BART 2nd Transbay Crossing. 5. Will the Salad Spinner (aka Salesforce Transit Center) have trains punch out to the east to Oakland, or loop back? Will it become a through station, or a stub end station with more limited capacity in the long run? 6. Where and how will passengers using Caltrain/HSR get across the bay to reach Oakland, especially along a new 2nd Transbay Crossing? Will it follow a through train crossing the bay to Oakland? Will riders make the 900+ foot walk to BART's Embarcadero Station or make a transfer to a new 2nd Transbay BART line that's a short walk? I won't be answering #5 or #6 but will attempt to answer #3 and #4. Let's see if stations should stay at their existing locations, be relocated, and where new stations should be. A preliminary note: train stations don't often have a single cross street or entry point. All these stations are actually a long rectangle that often have exits on each and in the middle. I've assumed that stations are about 700 feet long, especially for BART trains. If we step back, let's look at where these stations are. Would a 2nd new BART line go through it? Are they working well as station locations? Could the be better designed? Or would a new location be better? First we'll look at the priorities in placing a 2nd BART line through San Francisco, then at the stations. A second transbay BART line could go in a number of locations where it crosses Caltrain, but it's most likely to pass through SoMa, Mission Bay or both. Anywhere between 16th Street and Market is likely. Bottom line - we must make a key priority be that a great (efficient, quick and humane) transfer location between Caltrain and BART be actively pursued and built. The risk is that without a chosen 2nd Bay Crossing alignment, the transfer point between BART and Caltrain will be missing or weak. Mission or Howard BART line: a WIN! 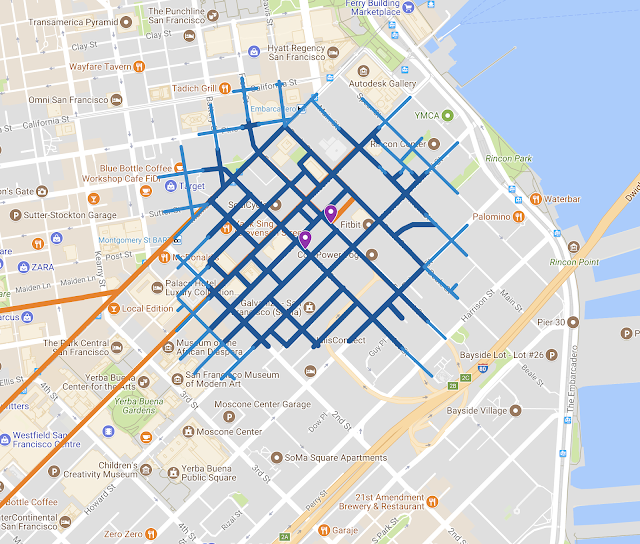 as short pedestrian tunnels would connect to the Transbay Center in between Mission and Howard stations. Transbay Center: a win, as the west end of the train station is only 170 feet from 2nd Street. Townsend: Not a good spot as the closest each line get to each other would be 2nd/Townsend BART and a 3rd/Townsend Caltrain station: a 900 foot distance. Transbay Center: at 1,200 feet from the Transbay Center, this is a very poor choice for connecting BART to Caltrain. It's even still relatively far from the nearest Market Street station (Montgomery) at 600 foot distance. Townsend: 3rd Street is one block away from planned 4th & Townsend station, but if the Caltrain station where moved one block to the east, they could be on top of each other at 3rd & Townsend. Transbay Center: Very far away. At 3,100 feet away, this cannot be considered a transfer. BART Market Street: a very good for transfers (it's at Powell Station), but bad for missing Downtown San Francisco. Townsend: the planned Caltrain station lies between 4th and 5th streets, so this would be the main Caltrain/BART transfer point due to the closer connection. A very good option from a transfer perspective. As mentioned above, not moving. Also, located right at the center of our 21st century downtown San Francisco. Transfer Station: A 2nd Transbay BART line could pass here and create a great transfer if it were located along 2nd Street, Main Street, Mission Street or Howard Street. Anywhere else, such as the proposed 3rd Street BART alignment, is too far away (i.e. from First & Minna at the center of the train station, it's nearly half a mile to a 3rd and Mission BART station. A transfer to the existing BART & Muni station at Embarcadero is good, but at 900 feet long, the pedestrian tunnel to connect under Beale Street cannot be considered an optimal transfer. As shown in the map below, a 2nd Street BART station would be within the quarter mile walk shed of the planned main exits of the train center onto First and Fremont Streets. With a connecting tunnel from the west end of the Transbay Center to 2nd St for BART, the connection is quite close. Quarter and Third Mile walk sheds from the Transit Center's Fremont and First Street exits. Orange lines denote transit lines that serve the station and reach out to a 10 minute journey time. Neighborhood: The station here is located in a decent place - near the existing SoMa job sites and housing, as well as pretty close to Mission Bay and the future dense Central SoMa area along 4th & 5th streets south of the freeway. Sports is big here: AT&T Park is 1,400' away, while the Warriors Arena is almost a mile away, 4,500' to be exact. Transfer Station: It's unclear whether a BART line would pass here, but there's a decent chance it will. The best options for getting close are by passing along 3rd St, 4th St, or 5th St. A station along King St, or Bluxome might work too, although more tricky. The Muni Metro Lines, T-Third, and N-Judah, have stations along Fourth Street and King Street respectively. Local bus: Four regular Muni bus and 3 express buses stop here, taking folks to Downtown, Van Ness, Chinatown and the Marina. Unfortunately, no buses or transit take folks to the nearby Mission District. Townsend Station between 5th and 4th Streets as currently planned. Quarter mile (dark blue) and third-mile (light blue) walk sheds. Orange lines denote transit lines that serve the station and reach out to a 10 minute journey time. 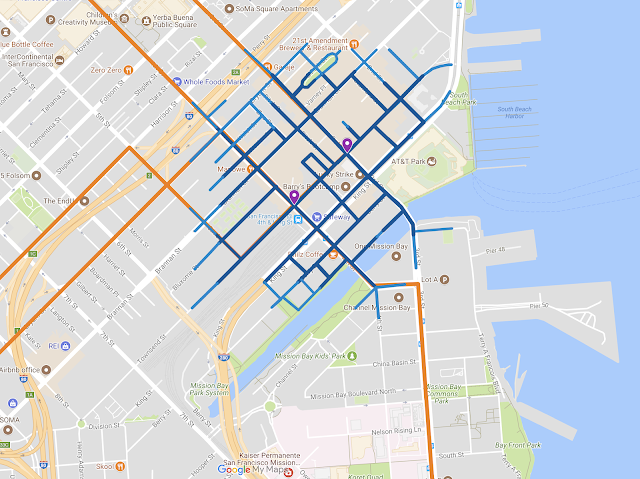 Note the walk shed is better at accessing points in Central SoMa and less so in Mission Bay south of Mission Creek. Townsend Station between 3rd and 4th Streets as I have proposed. Quarter mile (dark blue) and third-mile (light blue) walk sheds. Orange lines denote transit lines that serve the station and reach out to a 10 minute journey time. Note the walk shed is better at accessing points in Mission Bay south of Mission Creek, and a potential 3rd Street BART station while still also access Central SoMa. 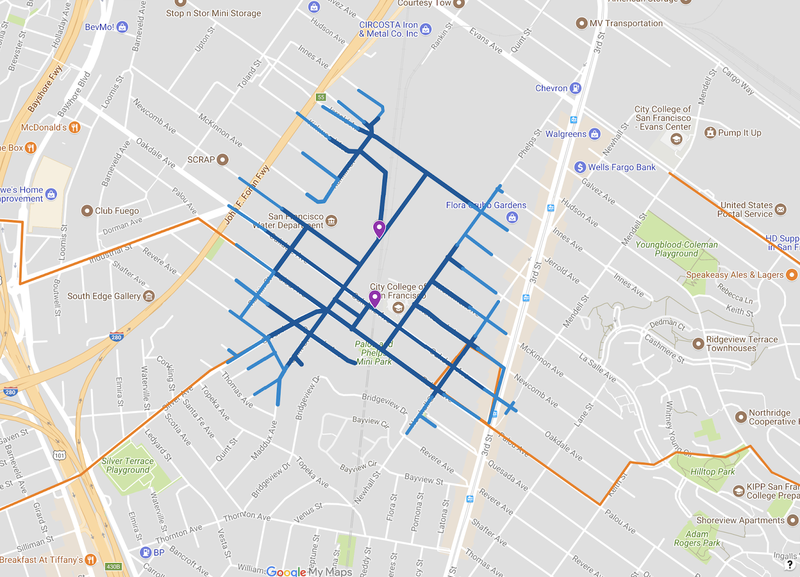 One downside of moving the station east one block would mean a slightly longer walk to the new Central SoMa development employment centers on 5th Street and 6th Street. The shorter distance to the Transbay Center (from 6,300 feet (1,900m) to 5,250 feet (1,600m)) may seem like a bad idea, but many examples in the world, including Chicago, London, Paris and Tokyo have regional trains with closer spaced stations in the city center. Neighborhood: Simply put, this station is in a rotten location. Hemmed against a hillside with little access, and in a low density neighborhood with industrial uses, the station isn't even near transit corridors. True, the Dogpatch is doubling or even tripling in population, but that's starting from a low number. Solution: Move the station, north, south or both to a transit corridor or place with higher density development and better transit access. 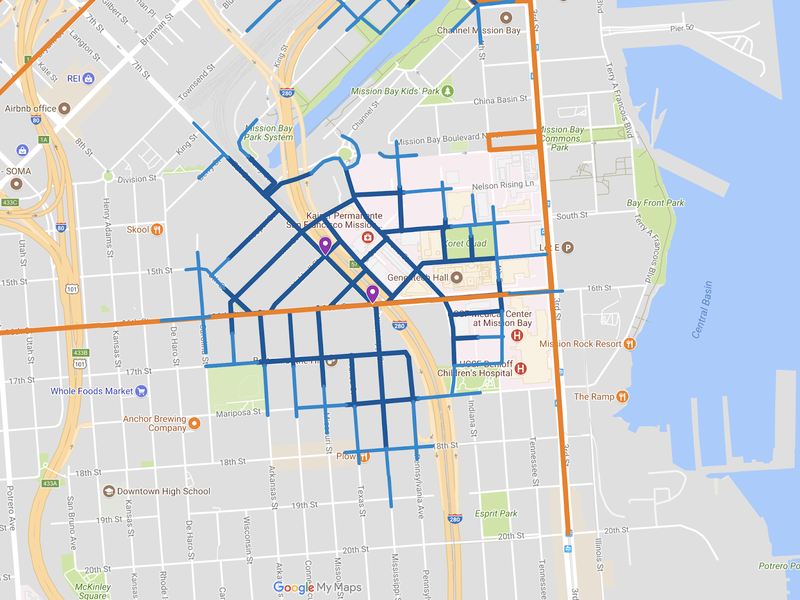 Best bet is to 16th Street, but Cesar Chavez could work too if the Islais Creek area densifies with jobs and housing as the Resilient by Design project proposes. 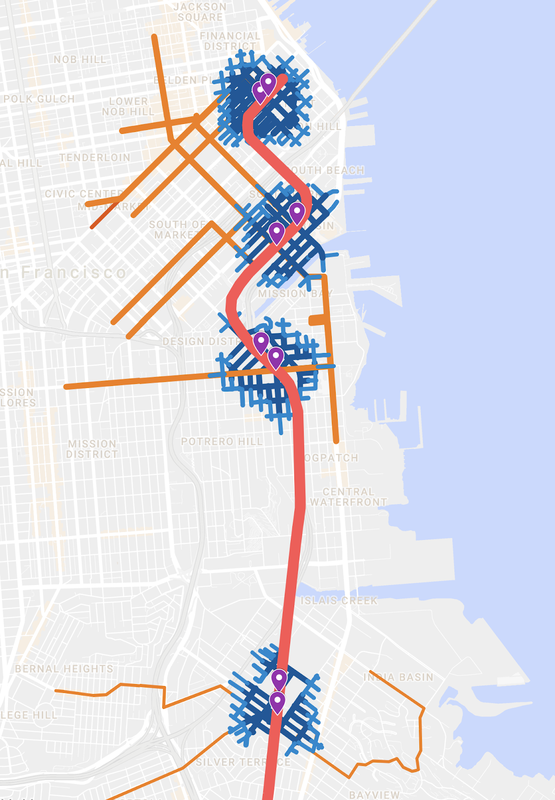 22nd St Station under Pennsylvania Ave - Quarter mile (dark blue) and third-mile (light blue) walk sheds plus moderate frequent bus lines (orange) are shown. 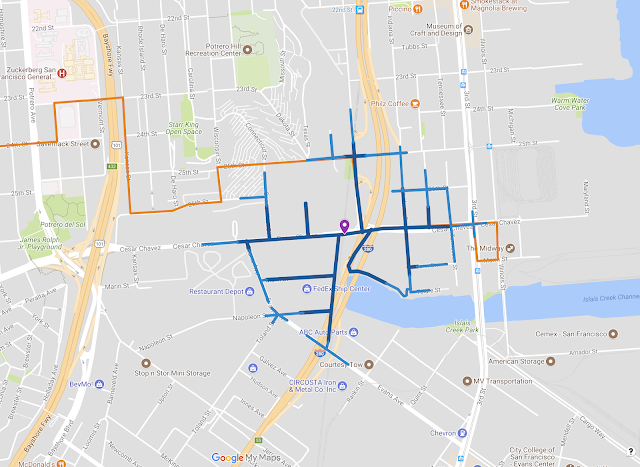 Neighborhood: Although no much in the way of dense jobs or dense housing exists along the Cesar Chavez or even the Evans corridor, a station here might make sense if densification is planned. Local bus: No busses currently serve the potential station location, Cesar Chavez at Pennsylvania Ave. However, if a station were placed here, replacing 22nd St, the 48-Quintara could be moved to stop at the station. Solution: Due to its proximity to the Oakdale station, locating a station here is less necessary, especially if a 16th Street station is created. Cesar Chavez Station at Pennsylvania Ave - Quarter mile (dark blue) and third-mile (light blue) walk sheds plus moderate frequent bus lines (orange) are shown. If we open the question of where to place stations, might not we consider adding a station in San Francisco. We are a denser city, with much growth happening in the east side of the city. Might a new or relocated station at 16th St in Mission Bay bring more people closer to their homes and jobs than 22nd St? Neighborhood: With Mission Bay to the east, and an evolving and densifying Potrero Flats to the east, while having a major transit corridor in the works (22-Fillmore bus), this location would be ideal for a station. The stop would serve jobs and schools with UCSF Mission Bay and the Medical Center, as well as CCA, and the many health and biotech jobs in the area. A stop here would also serve the Chase Center (Warriors Arena). As station here would also serve many more people living and working nearby than at 22nd Street. Chicago: Metra Electric, Millennium Station to Van Buren Station, 2,800 feet. Solution: Close the 22nd Street station and relocate to 16th Street. 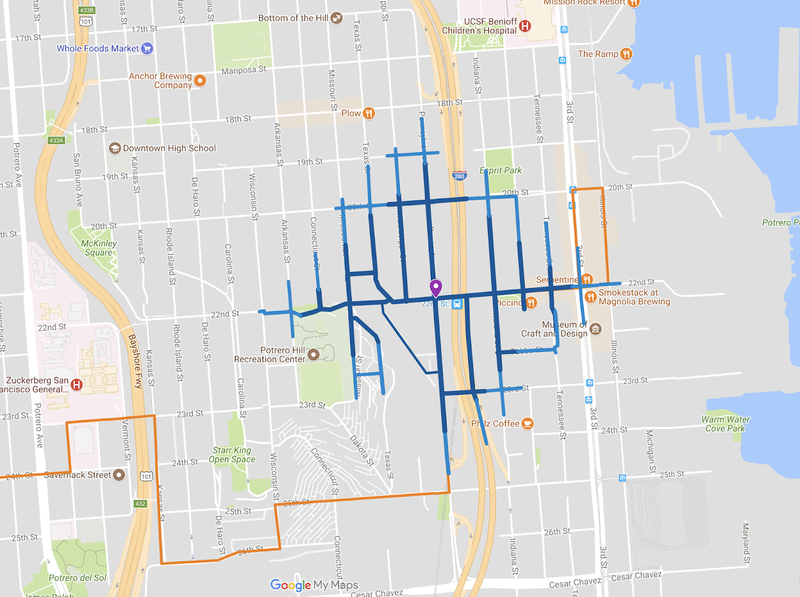 16th St Mission Bay Station at Mississippi and 7th St - Quarter mile (dark blue) and third-mile (light blue) walk sheds plus moderate frequent bus lines (orange) are shown. Map of both Mission Bay stations if both 16th St Mission Bay and Townsend Station between 4th and 3rd streets were built. Neighborhood: Residents of the Bayview and the growing Hunters Point neighborhood deserve and should have a regional rail station - especially considering the rail line already passes through the neighborhood. Solution: Keep proposed Oakdale Station location between Oakdale and Quint Streets. Improve local transit feeding the station. More on this from the SFCTA's study. When this station does get planned, addressing gentrification, housing and displacement challenges must also be addressed. 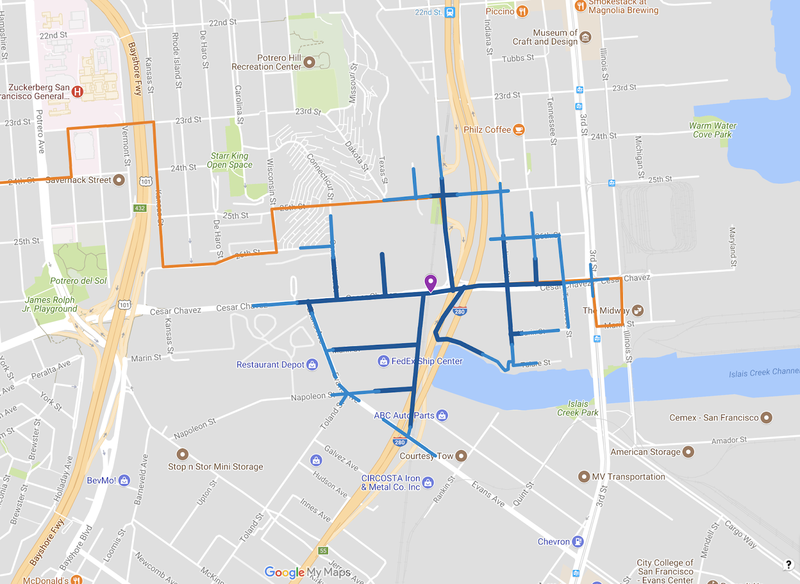 Oakdale Station at Quint - Quarter mile (dark blue) and third-mile (light blue) walk sheds plus moderate frequent bus lines (orange) are shown. Feel free to chime in with your own thoughts comments or ideas. Why are you leaving off the T line in the transit connections from the 22nd street (or Caesar Chavez) train stops? Also, I guess it's slightly out beyond your range, but the 22 (or replacement) is pretty connected, I used to do that walk all the time. 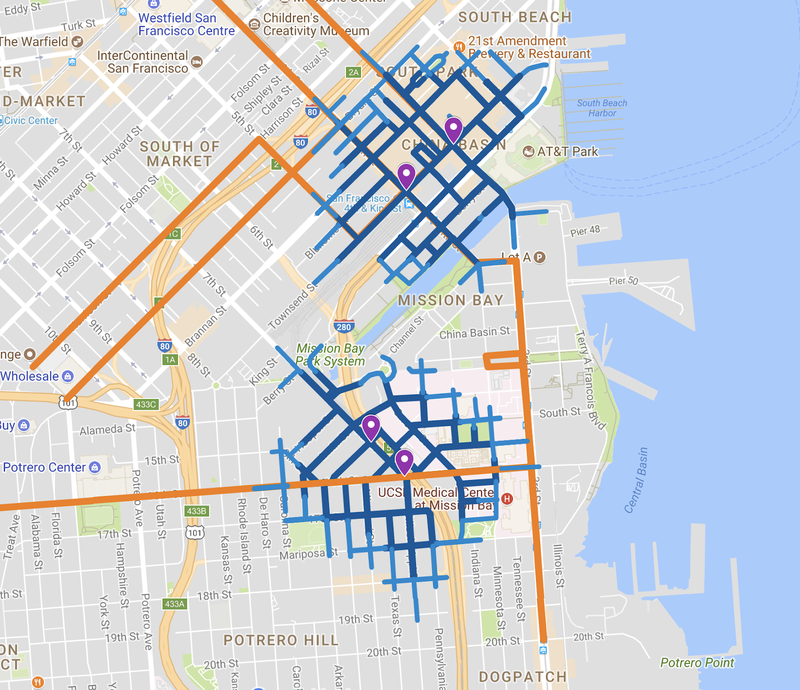 As someone who works in, and has lived in, Dogpatch, I'm sick of people wanting to take away our transit lines with no replacement while the neighborhood grows in both population and jobs. 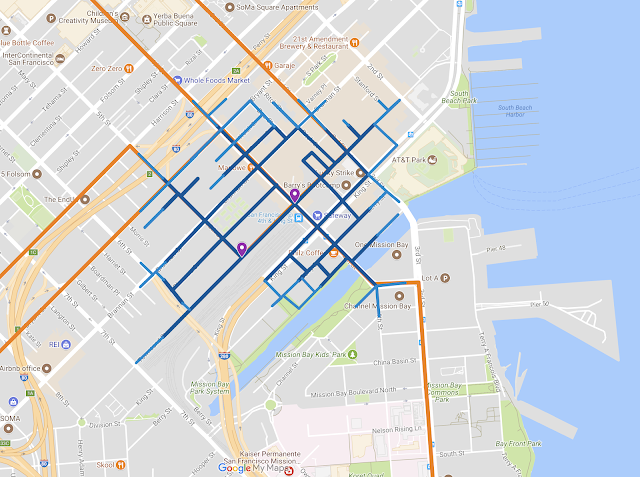 Like, what, the whole Pier 70 development is supposed to just not get have any transit connections? Good questions. Firstly I was relatively conservative with the connecting bus and train lines that count. I only counted existing or planned lines that passed the station exit or one block away. If I had more time I might have included ones 2-3 blocks away. In that case the 22 would count. Note that although the 22-Fillmore is planned to be redirected to Mission Bay some day, Muni plans to have either the 33 or possibly another line (55?) take the place of the 22 where it passes through Potrero Hill and Dogpatch. Lastly, I agree the Pier 70 development (as well as Potrero Power Plant) deserve more than the T-Third (which is only north-south) but also a transit service that runs directly into them - perhaps an extended bus from Potrero Hill down 20th St and/or 23rd St.
Hey there - interesting post, thanks. One nitpick - not sure if I'm misunderstanding your wording, but the N-Judah doesn't have stations "along" 2nd street - it has the one at 2nd and King, but from there it goes up the Embarcadero to roughly the ferry building. Also, what are your thoughts on travelators? They're much more common in Europe, but they can substantially reduce the effective distance between points. For example, a Caltrain station centered on 4th and King, with a pair of travelator-tunnels to the corners of 3rd and 5th, would be effectively "closer" to both the Central SoMa project *and* to a potential 3rd street tunnel. Really, I'd like to see travelator-boosted walkways extending a block or so from the Transbay Terminal in various directions as well (Especially to the Market St. Subway! ), but that might be a bit more ambitious, and I'm not sure it'd be worth it in all directions. 1. Your nitpick was accurate. I've changed the text from "2nd" to "King" as the N-Judah runs along King (and on to Embarcadero). 2. Travelators. I prefer not to have travelators in general, but they are very useful, practical, and sometimes in fact needed in particular cases. The proposed pedestrian tunnel between the Transbay Center and Market Street Subway under Beale St would definitely need a travelator due to its 900-1000' length. IF the Caltrain station were placed under Townsend between 4th & 5th streets, but a BART line had a "3rd and Townsend" station, I think some sort of reinforced connection would be needed - seemingly a pedestrian tunnel. With an 800' distance... you'd probably need a travelator. However, I'm trying to avoid that need for the rail transfer. Conversely I don't think you'd need a travelator for folks walking to from the train station to work into Central SoMa, regardless of where the stations are placed for BART or Caltrain.